As you will all know, Apple’s X Snow Leopard has gone on sale today and we’ve had a chance to have a very quick look at it. The new operating system has some new features and some smaller improvements to its recent predecessor many surrounding speed. This includes an installation time, which is said to be 50% faster, and shutting down and starting up times twice as fast. It’s time machine back up service, which was previously featured on its older operating system is also claimed to be 80% faster. The company has also added, what it calls Expose, a feature that lets you organise and search all your open windows, saving you lots of time and helping you find that Facebook or Twitter Window more easily. We had a look at this, opening 15 windows including pictures, websites and documents and unfortunately we have to agree that it’s pretty impressive. However the one feature we absolutely love, is more physical than software based. Apple has used the operating system to make it easier for people with disabilities, such as those with visual impairments to use their computer. They have done this through the touch pad, which these people can use to be told of where their cursor is and where to navigate to next. 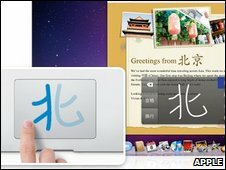 Those that can or are learning to write in Chinese can also use the trackpad to draw Chinese characters onto, and this will bring up a range of character options. Now we weren’t able to try this out, as we’re not blessed with bilingual skills, but we had a little doodle and some characters did come up. We’ll bring you a fuller review once we’ve had time to have a good play around with this.